Vicenza Italy is often skipped by visitors when it comes to select things to see in Veneto. It is understandable, because most people do not have much vacation time available. And it is a pity! My tip? Spend a day there, especially if you are passionate about architecture. Vicenza Italy – a World Heritage List town – is the capital of the Palladio architecture, and it is an out-and-out open-air architecture museum. In Vicenza lies the famous villa La Rotonda , plus several other buildings designed by Andrea Palladio, like the Teatro Olimpico. Plenty of stunningly beautiful architectural masterpieces! You can enjoy part of them taking a pleasant walk following a Palladio architecture itinerary in the pedestrian historic center of Vicenza. Vicenza may not be as romantic as the bigger Verona, or as suggesting as Venice, but its elegance, architectural refinement and harmony are undeniable. The original structure of Vicenza dates back to the Roman era, but the town boasts a strong Renaissance character. Some remains of the Roman period are still visible, like the criptoportico, some mosaics, bridges, the Roman aqueduct of Lobia and the Teatro di Berga. Vicenza has a centuries-old tradition of goldsmith’s art. It is not accident that every year in the Palladian town an international gold fair takes place, with makers and merchants from all over the world displaying jewels suiting any taste. More here about Vicenza gold and the most important jewelry fair in the world taking place just in this town. The core of the historic center of Vicenza is fortunately closed to traffic, so be ready to enjoy this Veneto town at its best. The starting point is this wide square, the heart of the town during the Middle Ages. Enter it through the gate placed under the imposing and well-preserved medieval keep, which is the only part left of the ancient castle, along with part of the walls. In the Piazza Castello you’ll see some palaces, like the unfinished Palazzo Porto, whose original design was Palladio’s, but finished by Vincenzo Scamozzi, another important Veneto’s architect of 1500s’. Just a hint of what you’ll see entering the center of Vicenza. It is the heart of Vicenza, a long pedestrian way embellished with a number of awesome palaces and lined with cafes and stores. It is the place where Vicenza's people use to stroll around. 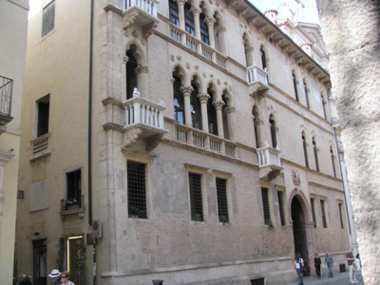 At nr 47 lies the 1400s Palazzo Thiene, with a gothic facade. Further on, at nr 67, you’ll see the Venetian gothick Palazzo Braschi-Brunello, dating back to 1480. A pearl of the Renaissance architecture is the Palazzo Trissino-Bastion (end 1500s), after the designs of Vincenzo Scamozzi, today seat of the City Council. Noteworthy is also the Palazzo Dal Toso-Franceschini-Da Schio(1477), a work of art of the late gothic architecture. At the end of Corso Palladio do not miss the Teatro Olimpico, the most ancient indoor theater in the world, and the last impressive work of Andrea Palladio before passing away in 1580. The theater shows off an amazing trompe l’oeil effect in his interior. The big central square, the core of the social and political life since the Roman Era, it is overlooked by the imposing Basilica Palladiana, a building which is the result of a number of remodelings made over the centuries. The last significant work was made by Palladio in 1546, incorporating the previous medieval palace into a completely new building, just the one that we can admire nowadays. There is a very narrow shaped 82mt/230ft high tower which dominates the square. The narrow basement dates back to the 12th century, while the upper part was added between 1300 and 1400. Another interesting building in Piazza dei Signori is the Loggia del Capitanio, the ancient headquarter of the Captain of the Republic of Venice, built in 1571 after the designs of Palladio. It is the Cathedral square. The Cathedral dates back to 1300s, but it was built over older churches. More recent are the dome and the big door, both designed by Palladio in 1565 and 1575. The cathedral was severely damaged by 2nd world war bombings. The western side of the square is dominated by the neoclassical Palazzo Vescovile (Palace of Bishop), dating back to the early 1800s. Nearby, under Palazzo Proti Roma, there is a Roman criptoportico. Relax yourself in this district crossed by bridges and canals, with its houses up against the river, and enjoy suggesting views of the town. 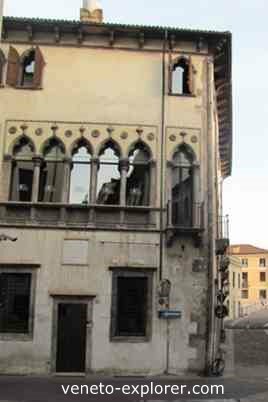 On your way from the Piazza Duomo, at the end of Piazza delle Erbe (Herbs Square) do not miss the Casa Pigafetta (1444), a nice example of gothic architecture, which belonged to Antonio Pigafetta, the chronicler of the Magellan’ s journey around the world (1481). Start from Ponte Furo (Furo bridge) built over the ruins of a Roman bridge, continue towards the 1-arch Ponte San Michele, built after the designs of the same architects who planned the Rialto Bridge in Venice. Afterwards you’ll reach the medieval Ponte Barche (originally much older, dating back to the Roman era). Finally you'll get to the Ponte degli Angeli. It is one of the most beautiful districts of Vicenza, embellished with several majestic palaces. Among them, the Palladian Barbaran-Da Porto palace (1570). Via Fogazzaro is crowned with beautiful palaces, like the Palazzo Valmarana-Braga (Palladio). The Romanesque-gothic Tempio di San Lorenzo (Temple of San Lorenzo) dates back to 1280. It lies just outside the gate to the old town, near Piazza Castello. Along with elegant swams, you can admire the fine Loggetta Valmarana (1592) and the Loggetta di Baldassarre Longhena (1649). It is what is left from the majestic architectural complex which embellished the big italianate garden of the aristocratic Valmarana family. The way to Monte Berico (Berico Mount) is a traditional walk of the Vicenza's citizens, a steep road climbing up to a large square, a viewpoint from where you can enjoy a nice view over Vicenza, allowing ample vision as far as the remote Dolomites mountains. Located in a bucolic hill not far from the center of Vicenza, it is the worldwide known architectural masterpiece of Andrea Palladio. 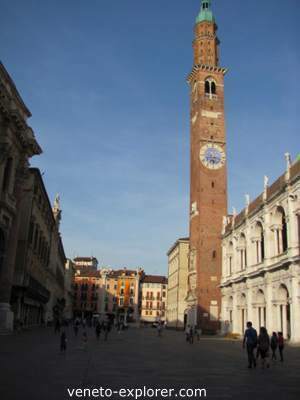 The history of Vicenza Italy is similar to those of many cities of Veneto. It was founded by the ancient Venetos, then it passed under the Romans. At the times of the Roman Empire decay, it was subjected to the Barbarians invasions, turning into a Dukedom under the Lombards and a County under the Franks. In 1164 it became a Free City-State, until 1404 when it passed voluntarily under the dominion of the Venice Republic, enjoying a period of great wealth and glory. Over the 1500s’ the architect Andrea Palladio, born in the nearby Padua, concurred to turn Vicenza into a jewel of the Renaissance architecture. After the Serenissima fall in 1797, it first passed for a while under the Napoleon rule and later under the Autrian-Hungarians. Vicenza, and the rest of Veneto, joined the Kingdom of Italy - born in 1861 - in 1866, after the Third Independence War. The outskirts of Vicenza are very interesting as well, with their varied morphology, ranging from the plain, the enchanting Berici hills, to the beginning of the Dolomites mountains. Do not forget the lush and rolling Asiago plateau , where the famous cheese comes from. An ideal natural setting for hiking and nordic-ski (the worls championship of nordic ski sometimes took place here, taking advantage of its over 500Km/310miles of trails available). In terms of art and history too the surroundings of Vicenza deserve a getaway: don't miss the medieval walled town Marostica, with its majestic castle and its pictoresque living chess game, and the nearby ancient Bassano del Grappa renowned for grappa (a fine local distillate) and ceramics production. Looking for an accommodation in Vicenza? Find here some hotels near the Vicenza historic centre, with a good price-quality relationship and highly rated by guests.